Note the owner’s name, “S. Limbourne” was engraved on the bolt release (and trigger guard, see below). 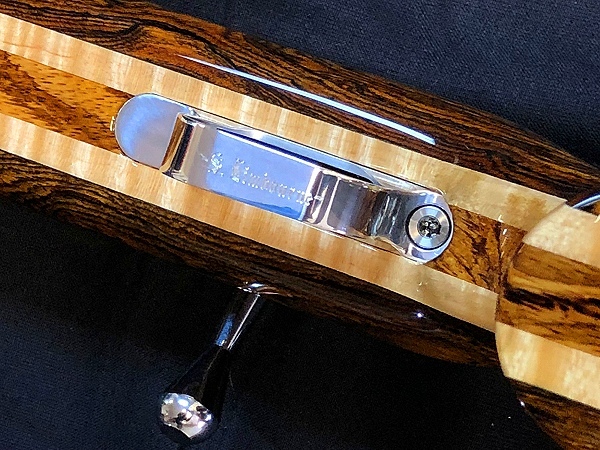 Who doesn’t like a spectacular figured-wood stock, particularly when it is combined with a superb custom action and a tack-driving barrel. Here’s some eye candy for Wednesday before Thanksgiving. 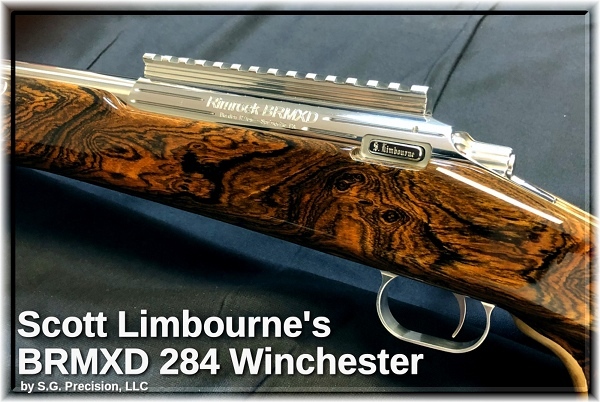 This is a custom .284 Winchester F-Class Open division rig created by gunsmith Thomas “Speedy” Gonzalez for competitive shooter Scott Limbourne. 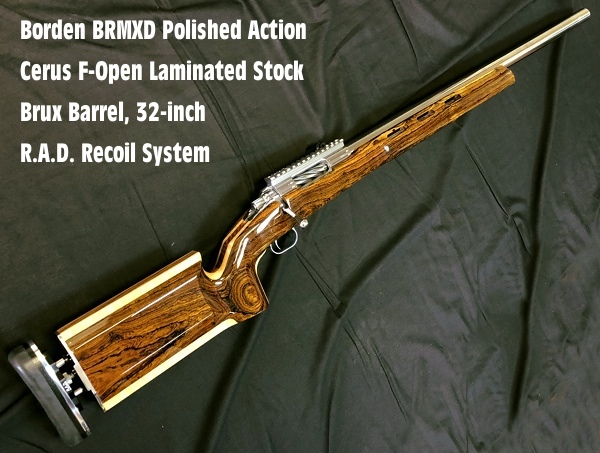 The handsome Bacote wood figured stock comes from Cerus Rifleworks, while the action is a polished Borden RBRP BRMXD. Two Brux 1:9″ twist barrels were chambered for the project, both finished at 32″. The stock is also fitted with a R.A.D. Recoil System. This rig has top-of-the-line hardware all around. Extras: Carbon Fiber Tunnel Plate, Custom Engraving Work on Action, Trigger Guard, and Bolt Release. You’ll find more impressive rigs on Speedy’s Facebook Page. 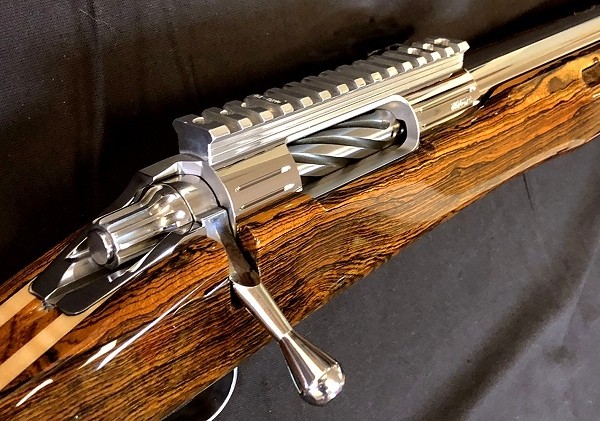 If you’d like a superb custom rifle like this, call Thomas “Speedy” Gonzalez at 972-672-6630, or send email to: speedy.godzilla [at] msn.com. 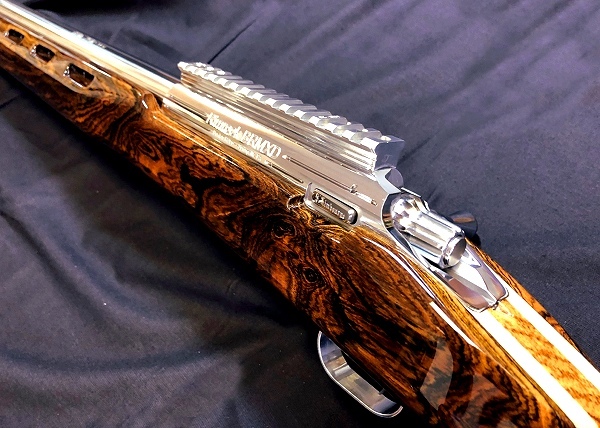 Share the post "Handsome .284 Win F-Class Rig with Polished Borden Action"
Here’s a treat just in time for the holidays — you can see a video view of 1000-yard Benchrest competition tonight on Shooting USA television. 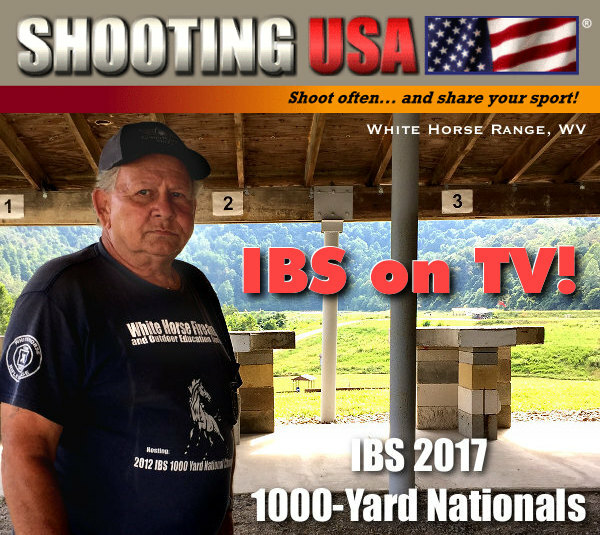 The Wednesday, November 21, 2018 episode of Shooting USA features the 2017 IBS 1000-Yard National Championship held at the Whitehorse Shooting Center in Peeltree, West Virginia. This Shooting USA episode takes you to the Whitehorse 1K Range in September 2017. You can see the action on the firing line and the Shooting USA team also interviews many competitors. Watch this episode on the Outdoor Channel at these times: 9:00 PM Eastern and Pacific; 8:00 PM Central. 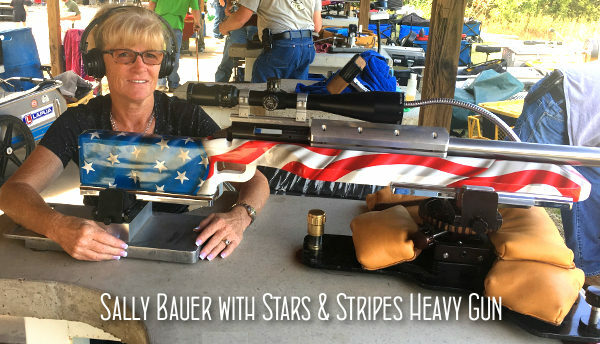 If you want to learn about the 1000-yard Benchrest game, definitely tune in to Shooting USA on September 26, 2018 (tomorrow) to watch last year’s IBS action. There were nearly 120 shooters competing (118 in Light Gun, 107 in Heavy Gun). To learn more about on this event, read our detailed 2017 IBS 1K Nationals Match Report. At the 2017 Nationals, conditions were challenging to say the least, with rain storms, spiraling winds, and fog. In fact, rain and fog on Saturday (with cancelled relays) caused the Nationals to be extended by one day through Monday. What’s more, of the 107 shooters listed in the Two-Gun Overall results who actually shot both guns, there were dozens of DQs. 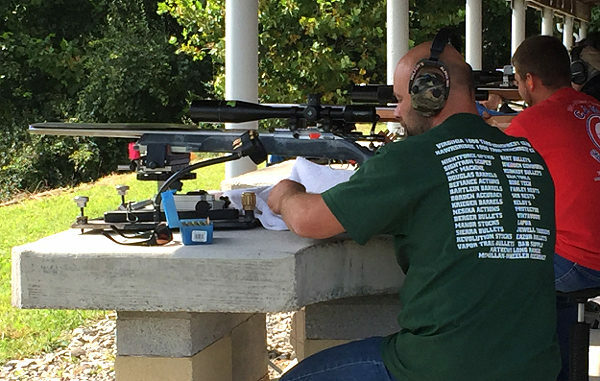 Share the post "IBS 1000-Yard Nationals Featured on ShootingUSA TV Today"
In today’s economy, Free is good. 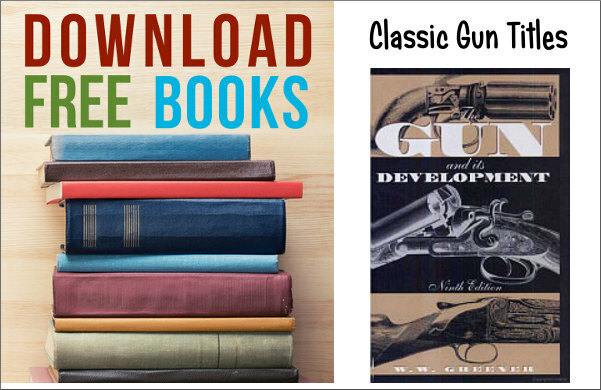 Here’s a list of classic, older shooting books that can be downloaded for FREE from Google Books. 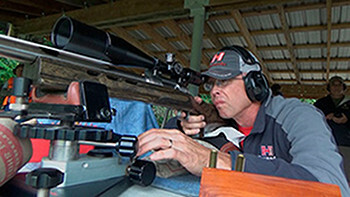 This list includes many classic treatises on marksmanship that still have value for today’s competitive shooters. In addition, we’ve included illustrated firearm histories, such as Townsend Whelen’s fascinating book, The American Rifle, and The Gun and its Development (9th Ed. ), by William Wellington Greener. In the list below, the title link will take you to the Google Books page for each book. You can read the entire book online, or you can download it to your computer as a PDF file* and save it (or print it). You can also create your own Google Library and save the books there for access from any computer. The Bullet’s Flight From Powder to Target, Franklin W. Mann, 1909, 384 pages. Irish Riflemen in America, Sir Arthur Blennerhassett Leech, 1875, 216 pages. The American Rifle, Townsend Whelen, 1918, 637 pages. Suggestions to Military Riflemen, Townsend Whelen, 1909, 243 pages. Modern Rifle Shooting From the American Standpoint, W. G. Hudson, 1903, 155 pages. Manual for Rifle Practice: Including Suggestions for Practice at Long Range, George Wood Wingate, 1879, 303 pages. How I Became a Crack Shot — With Hints to Beginners, W. Milton Farrow, 1882, 204 pages. Cartridge Manufacture, Douglas Thomas Hamilton, 1916, 167 pages. 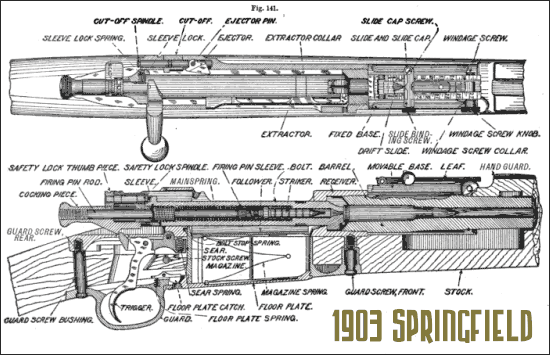 Description and Rules for the Management of the United States Rifle, Caliber .30, Model of 1903, United States Army Ordnance Dept., 1904 (5th rev. 1914), 72 pages. *To download a book, first click the title from the list above. Then, once you’re at the Google book site, look for the icon that looks like a gear in the upper right-hand corner. Click that and a pull-down menu will appear. Select “Download PDF” from the menu — this will bring up a security question to make sure you are a human. Respond to the security question correctly and your normal download prompt will appear. Choose a location to hold your new e-book, and click “save”. 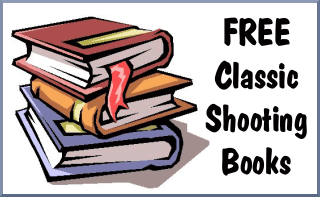 Share the post "Download Classic Shooting and Marksmanship Books for Free"